How long are you willing to wait for LUNAR 3? or.... for the next 5 Years! Heh, I guess it's been about that long since EB's US release, hasn't it? I'm not great at remembering release dates, but I seem to recall 1995. Yup, it was either September, or October 1995 that EB was released stateside. It was originally supposed to come out in July, but it was delayed. I remember how badly I anticipated it, because of the magazine ads for it, and just having a sequel to a game that I adored. I know when I first started playing Eternal Blue that it didn't feel right to me, probably because the artistic direction was a lot different than The Silver Star. Of course, that was just the initial impact of something completely new, and as I played it just got better, and better. It was so cool having familiar locations like Vane, and experiencing the after effects of the impact drawn from the original. I was disappointed that the Silver Spire, and the Star Tower were no longer there. Did I remember those correctly? It's been so long since I played. Close. Silver Spire and Crystal Tower. The annoying thing for me is that I can never remember which is which. I *think* the Silver Spire is the second one you go into in TSS, with the Star Chamber (Room of Stars?) at the top where you unmask Xenobia, but I'm not sure. Yeah, I think that's correct as well. There seemed to be more to the Star Chamber where Xenobia was unmasked than was ever revealed. Perhaps the two towers had something to do with Vane's planned resurrection in EB before being nixed. Yeah...I always loved that room, with the sparkling floor. It was never said what she was doing up there. Or why Alex and Mia had to go through the Cave of Trial to get to the Spire, but Nash was just waiting for them next to the entrance...but that's a different question. I seem to recall seeing the Silver Spire in Vane in the original Sega CD EB, with its door bricked-over. Technically, I guess I've been waiting (or having the thought of a "Lunar 3" in my mind) since summer 1998, after Lunar 2 remix came out...I was so sure Lunar 3 was going to be made eventually...given how much buzz was garnered from Kou's Gamest Mook site (the best Lunar 2 remix site at the time), it just seemed like it would definitely happen. 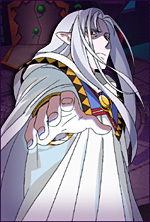 Now it looks like Dragon Song's success will determine Lunar 3's fate from what I hear. Yes, Lunar EB for North America originally came out in September 15, 1995...at least, that's what WD told me when I asked them. But I cannot confirm exact date myself (never pre-ordered the game), though according to this it was shipped out to WD's pre-order list on the 11th, it was definitely released by the 20th when people started writing their impressions on it, so it was sometime in this time frame (Sept 18 today), ten years ago. Yeah, one of the towers was. It was kind of annoying to have it visible but inaccessible, like Black Rose Street. Oh well. I found that he brought it back about a year ago, but it's damaged. Many pages don't work, some graphics are missing, etc. And it's only the EB site. The SSS Gamest Mook, as far as I know, hasn't been put online again. I recall the Silver Spire being the tower on the left, and the Crystal Tower (thanks Alun) being on the right. At least it was that way in The Silver Star. I remember playing Eternal Blue, and thinking why the hell aren't the spire and tower accessible in Vane. I don't recall them being destroyed in the remake either, just the floating landmass that the town sat upon. I guess I just wanted them to have a purpose in the sequel, seeing as how they were such obvious points of interest in the town. I'm thinking it's possible that the Crystal Tower might still be located in Vane during the time of EB, but the Cave of Trial may have been shifted drastically when Vane fell, sealing off the way there. There has to be another way to the tower, though, perhaps through the Guild; it seems very unlikely that Lemia and friends went through the Cave of Trial every time they had a ceremony up there. Not to mention Nash somehow waiting at the doorway after you come out of that cave. Still, the fall could account for a lot of weird stuff. Not Black Rose Street's closure, though. Well, Black Rose Street was a cool place, but it wasn't nearly as important to the world of Lunar as the towers in Vane are. It's not beyond reason that it would be gone in Lunar 2. I was a little disappointed that it was gone, too, though. It's also noteworthy Meribia's port for some reason kicks the bucket. Or at least you can't walk out on it. I guess Master Lunn didn't care much about shipping. The thing that gets me about Black Rose Street is that it's visible on the map. I wouldn't have been particularly bothered if it weren't there at all, or had been assimilated into the city proper, since Vane's fall would probably change the magicians' separatism. But having it there but inaccessible bothered me because I thought there'd be some plot element involving it and there wasn't. Yeah, I remember being a little disappointed by Black Rose Street not getting a plot point of some kind, but I remember that one of the shops in Vane in Lunar 2 was named the Black Rose Magic Shop (or something to that effect), and that kinda appeased me a bit. We gotta keep our hopes going!!! Like the mentioned above: ...Never give up, never surrender. Remember, we wield the power of humanity! With that, anything becomes possible!! Just like me, lots of Lunar fans were awaken by the new of this new Luanr game, and maybe with the success of Dragon Song, people will bring it back on their memories (this remembers me Nall's speech to Ruby on EBC) and there will bw a project on making a Lunar 3. The release of a new Lunar game after all these years is a undeniable sign that the Lunar isn't dead, and if we all pray to the goddess and keep the emails going who knows if we can get a new (and real) Lunar game soon?